Haunting: Australia will have its world premiere on the new Syfy channel in February. Paranormal investigator Robb Demarest, best known for Ghost Hunters International, will lead a team of six as they hunt for signs of the paranormal in Australia’s most-haunted locations. The Syfy channel, which will screen in HD on January 1st, has announced more details of its upcoming programming. 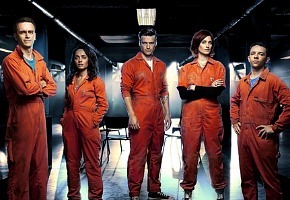 It includes the Australian premieres of Misfits (Season 5) on Thursday 2 January 8.30pm AEDT and Haven (Season 4) on Tuesday 7 January 8.30pm AEDT. Warehouse 13 (Season 5) and the second season of Defiance, starring Grant Bowler, will premiere in mid-2014. Syfy content will also include Stargate SG-1, Torchwood, Primeval, Doctor Who, Sanctuary, Ghost Hunters International, Orphan Black and Eureka. A new website – www.syfy.com.au – launches in December. its stupid people get a si-fi service yet horror fans are still being short changed on Foxtel. Its a sick joke. Yeah where is the Star Trek series? Nice to see that they seem to be having similar shows as before. Anyone know if Lost Girl will be on the new channel? ABC have lost misfits? Didn’t they used to run it before paytv? Foxtel and SyFy have just squeezed out the middleman and split the proceeds. And they will have Misfits before ABC2 and Haven before 13th Street. So pretty much the same shows that are on now. I hope all the star trek series go onto it!